WBCHSE Result 2019 - West Bengal Board of Higher Education also known as West Bengal Council of Higher Secondary Education (WBCHSE) will release the WB Board 12th Result 2019. The WBCHSE Result 2019 will be declared for only those candidates who appeared for the WB Board 12th exam 2019. Students can expect to check their WB Board 12th Result 2019 in the first week of June, 2019. Considering the previous year WBCHSE dates, the WB class 12 Result was declared on June 8, 2018, we can assume this year WBCHSE Result 2019 to follow the similar footsteps. JagranJosh will be closely coordinating with the WB Board in regards to the WBCHSE result 2019, and provide daily updates, news and notifications on the same. Students can access their WBCHSE Result 2019 here on this page and also from the official website of the board- wbchse.nic.in, wbresults.nic.in. Here, students will find all the latest and updated information pertaining to the WB Board 12th Result 2019 such as its important dates, how to download the result, what to do next post the WBCHSE Result 2019. The WBCHSE Result 2019 is expected to be declared soon after the exams get over. Although the final date is yet to be announced, the buzz suggests that the board is likely to announce the WB Board 12th Result 2019 in the month of June 2019. Jagran Josh will help you throughout the WBCHSE 12th Board Result 2019 by providing relevant information about the exam. We will also provide you the result, once they are announced. All the students will be able to view, as well as download their WB Class 12 Result 2019, once it has been officially released by the WBCHSE. How to check WB Class 12 Result 2019? With tensions rising among the students, a simple way to calm the nerves would be to look at the result stats of last year. This data will help the students understand the strictness and evaluation standards followed by the examiners to check the answer sheets. It also helps students build right and realistic expectations with regards to WB Board 12th Result 2019. For this purpose, we have provided the key statistics of last year's WBCHSE Result below. WB Board 12th Result Analysis 2018- The overall pass percentage of last year was 83.75 per cent. Total 8, 26,029 students had appeared for the West Bengal HS Examinations this year. More than 11 lakh students had appeared for the Class 10 examinations this year. According to reports, the overall pass percentage was 85.49 per cent this year. What after WBCHSE Result 2019? There is bound to be both chaos and excitement among exam takers after the WBSCHSE Result 2019 is declared by the board. As soon as the WB Board 12th Result is out, students will be able to check their WBCHSE result 2019 and download the same. Students should download their WB Board Result 2019 once they are made available here in this article or from the Boards’ official website. These can be used at the time of admission process in the colleges and schools and are considered as provisional until the originals are submitted for verification. However, the students must also remember to collect the original scorecards from their respective schools as a printed or downloaded copy of the WB Board 12th Result 2019 will not be accepted as an officially valid document. In case the students find any discrepancy in their mark sheets they should connect to their concerned institution. After the results are out, WB Board Result 2019 will bring both good and bad news. While some may be celebrating the outcome of their hard work, there will be some disappointed with their performance. Such students should not lose hope and take it as an end to their future. In case the students do not feel that their efforts have been truly justified in the scorecard, they can apply for re-checking / re-evaluation of the answer sheets. In case there is any change in the final mark tally, the same would be updated in the original mark sheet. There may also be cases where a student unfortunately fails in the exams, he will be provided with another opportunity to prove himself. The student will be able to appear for the compartmental/ supplementary exam. The supplementary examination may be scheduled to take place in the month of June. The same will be notified here in this article and also by the board on their official website. 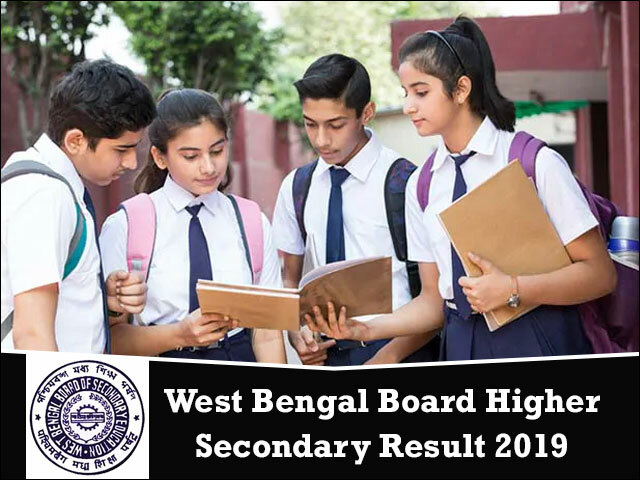 Students are advised to bookmark this page for any update on the WB Board 12th Result 2019; they can also fill in their details on the link shared in this article to receive notification in regards to the WBCSHE Result 2019. West Bengal Council of Higher Secondary Education (WBCSHE) came into existence through the West Bengal Council of Higher Secondary Education, Act 1975. It was established to regulate the educational system at 10+2 level. The WBCSHE is responsible for conducting examinations for the evaluation at Higher Secondary level and it also provides the curriculum, syllabus and the courses of study and prescribes the textbooks etc. Every year, 7 lakh plus students participate in the WBCSHE Board Examination. The West Bengal Board of Secondary Education is entrusted with responsibilities such as providing the curriculum for affiliated schools, monitoring the implementation of education policies and conducting yearly West Bengal Board Madhyamik Examination. Each year, around 10 lakh plus students take the West Bengal Board Madhyamik Examination. WBCHSE is likely to announce the West Bengal 12th Board Exam 2019 by 15th June, as per the latest reports. Get complete details about WB 12th Result 2019 here. The WBCHSE has declared the HS Result 2018 on the official website that is wbresults.nic.in. The WBCHSE Result 2018 is now LIVE. The West Bengal Council of Higher Secondary Education (WBCHSE) which conducts the West Bengal Class 12 examination has announced the WB HS Result 2018 shortly on the official website of the Board i.e. wbresults.nic.in.